Mark Cerny's looking forward to another decade or two of Sony achievement. Nintendo's core values, PS4 lead architect Mark Cerny believes, have only been strengthened by the design team's longevity; the core group has been working together for over 30 years. "Well, we on the PlayStation side of the business have only about 20 years together now," Cerny told a Gamelab audience in Spain, "but I'm really looking forward to the next decade or two with Shu [Yoshida], Andy [House] and the other amazing talents of Sony Computer Entertainment." Cerny's been working with the PlayStation in its many iterations for some time, which is why he was able to persuade Sony to put him in charge of the PS4's development; all, he says, part of Shuhei Yoshida' "master plan", to put a software expert in charge and run the project like a game director. "The three muskateers are back," Cerny went on to say, referring to Sony's appointment of Andrew House and Yoshida to senior positions, while Cerny led the PS4 development project. "One of the small results of that - but huge for me," he said, "was that it provided a further boost to the engagement ... with game developers around the world." Cerny hopes that this core team of "amazing" people will help shape Sony's core values, becoming as integral to the company as Nintendo's team has become to Nintendo. 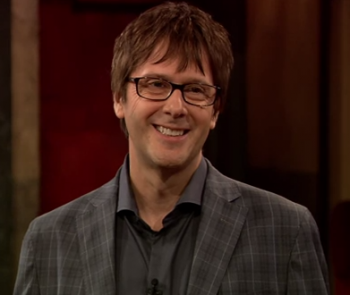 Last time we saw Mark Cerny, he was chewing the fat with Jimmy Fallon over on Late Night. "[The PS4] is the most powerful video game console ever made," Cerny said at the time, and by the sound of it Cerny's looking forward to the day when he - and the Sony team - top that achievement with something even better.